Vote now in the Tumblies 2015! Comments Off on Vote now in the Tumblies 2015! 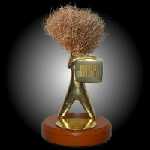 Voting is now open in the Australian Tumbleweeds Awards 2015! Now in its 10th “amazing” year, the Australian Tumbleweeds hails the failures (and occasional successes) of this nation’s comic talent. You have until midnight at the end of Friday 8th January 2016 to vote. Please only vote once. Full rules and instructions can be found with the voting form – please read the rules carefully! The winners will be announced on or about Australia Day 2016. As always, the official hashtag is #tumblies.